We just heard a song of an amazing newcomber band. It's a song of their upcoming album "Rats In The Burlap". We are not quite sure if they are canadians or scots.... but the sound really great anyway! So give them a listen (klick HERE) und support the newcomer bands!! See you in europe The Real McKenzies! It will be a blast! Check the tourdates on our page or on http://www.realmckenzies.com/. "Don’t be caught with your kilt up." TV Smith is still on tour with the UK SUBS - but of course, he won't stop touring. So he will be back in Germany on April 29th 2015. The first shows will be with "The Bored Teenagers". So make sure to get you tickets in advance. 01.05.2015 GER / Helgoland / Rock 'n' Roll Butterfahrt SOLD OUT! ROUGHNECK RIOT - BROKEN VAN. Hey friends - what a weekend! 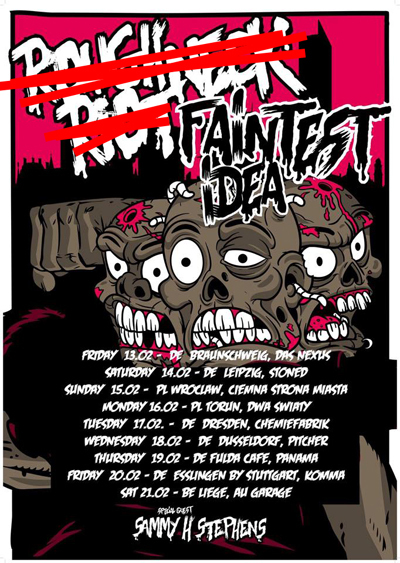 BUT Faintest Idea & Sammy H. Stephens will continue the tour! So - Ska Punk & SingerSongwriter - Fans don's miss that and come around! And - THANKS the everybody you came to the Sold Out SO36 Show with the UK SUBS. We had an amazing time and so much fun! & thanks to IGGY NOP for a wonderful Aftershowparty! By the way - UK SUBS are still on tour! Check our website for all infos! On Friday, February 13th Berlin will be full of great punk! The UK SUBS are finally back to play in our favorite club - SO36! Together with their good friend TV Smith they will show you some legendary songs! Local support are the great "Grubby Things" - so make sure be early - showtime 20.30! And after the show we will continue with a great - Teenage Kicks Party! DJ IGGY NOP will show you the best songs of the 70s & 80s. Don't miss that! See you on friday! Cheers! THIS invasion from the UK is starting tomorrow at Nexus in Braunschweig. You better don´t miss it! The Roughneck Riot Folkpunk as it´s best, Faintest Idea Skapunk and Sammy H Stephens Singer/Songwriter. We are very proud to announce that Fat Wreck Chords teamed up with their good friends at Stomp Records to release The Real McKenzies' latest epic album "Rats In The Burlap" on March, 24th in Canada. Releasedate for the rest of the world is April, 7th. Stay tuned for advance track giveaways, pre-orders and streams! "Ahoy there. 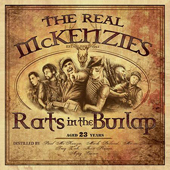 On behalf of The Real McKenzies and myself (Paul McKenzie) we are pleased as punch & haggis to announce the release of our latest album Rats in the Burlap. This album is chocked full of new songs that we just know will appeal to all. The lads and I are proud to have completed this latest endeavor along with the help of Little Joe and Fat Mike. With Josh Garcia at the helm and great cover art, we are confident and enthralled to have had the opportunity to have had released another masterpiece. Let the tours begin!!!" Check our "on Tour" segment or http://realmckenzies.com for the tourdates! THE REAL McKENZIES & THE OFFENDERS at "Die Festung rockt 2015!" Die Festung Rockt in Kronach / GER announced their line up including The Real McKenzies and The Offenders! This festival is taking place on may 30th. Also confirmed are Deez Nuts, The Prosecution, Sondaschule and many more.